Founded in 1832, Gilmer County is located on the very edge of the southwestern Blue Ridge Mountains of North Georgia. Gilmer County named after George R. Gilmer former governor of Georgia is a land of great beauty from its towering mountains to its rolling foothills, vast meadow-lands, renowned apple orchards and an excellent vineyard. 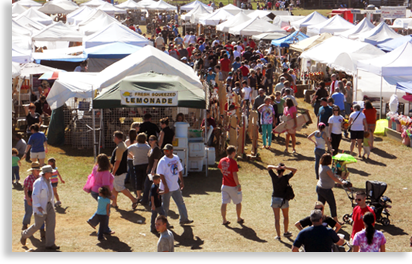 The county is known as the “Apple Capital of the World,” drawing large crowds to its annual Georgia Apple Festival held the second and third weekends in October. Due to the fact that Gilmer County contains nearly equal portion of mountainous country and agricultural lands, the term “Agri-Tourism” has become popular in characterizing Gilmer County. The county’s annual festivals and local farmers markets directly target the heritage of Gilmer County’s long history as an agricultural center. The county’s four seasons of temperate weather is the key to its continual successful harvest, an ideal climate for orchards, vineyards as well as a variety of other crops. The historic towns of Ellijay and East Ellijay are popularly known as the “Ellijays.” The Ellijays form a community center serving the greater Gilmer County area and its ever-growing tourism and relocation market, including numerous popular events and festivals offering outdoor fun and adventure for visitors throughout the year. Within the Ellijays there’s shopping, dining and sightseeing within the historical town of Ellijay. Across the river in East Ellijay along the corridor of 515/76 there’s shopping and dining plus various services and franchises. You could say Gilmer County and the Ellijays are an all in one destination for all ages. When it comes to near-perfect temperatures and natural beauty, Gilmer County dwells in an ideal setting with majestic mountain ranges reaching up to touch the sky, a backdrop so spectacular it both touches the soul and gratifies the eye. Scenic drives along the ever-expansive landscape of the county speaks for themselves with Spring’s pink and white apple blossoms dominating the countryside, while wildflowers line the roadsides, reaching across meadow-lands and foothills. Summer is the time for the great outdoors and those sporting enthusiasts and family members that just can’t wait to get out, get going, and have fun. Fall covers the landscape as if it were a magnificent multi colored quilt thrown aimlessly across the landscape, bunching up in places forming mountains, ridges, small hills and wide valleys. Winter season is mild and temperate, ideal for those quiet times to escape into a tranquil state of peace, contemplation, and rejuvenation. During this time visitors and residents alike often find the upper mountain ridges and peaks crowned with a blanket of snow. The Cherokee called this region of the Blue Ridge Mountains the “land of many waters,” due to the regions numerous waterways, consisting of rushing springs, creeks and rivers. A land of natural and man-made lakes and glorious waterfalls all powered by the heavens bounty of annual rainfall. Three rivers within Gilmer County, the Ellijay, Cartecay and Coosawattee Rivers, criss-cross the length and breadth of the county merging in the historical towns of “The Ellijays.” Fishing, canoeing, or tubing is available along sections of these rivers, plus there’s local white water rafting and kayaking on the neighboring Ocoee River. Carters Lake, located just southwest of the Ellijays encompass 3,200-acres with 60-miles of shoreline, and a lower re-regulation Lake within a 1,000-acre boundary. There’s boating, fishing, camping, hiking, mountain biking and more awaiting its guests. Cresting the heights of Gilmer County are densely forested Blue Ridge Mountains and wilderness lands. The great outdoors of Gilmer County's landscapes and natural wonders offer fun, adventure and excitement for camping, hiking, mountain biking, horseback riding, scenic drives, paintball, golf, fishing, boating, rafting and kayaking. Along the county’s southern reaches lies stunning Amicalola Falls State Park, featuring the highest waterfall in Georgia. Bordering the northwestern regions of Gilmer County is Fort Mountain State Park with its mysterious archaeological site of prehistoric ruins. Gilmer County and its historic towns and communities, are cradled in the northwest corner of North Georgia’s Blue Ridge Mountains, along the state lines of Southeastern Tennessee and far Western North Carolina, and ideally located just 80-miles from Atlanta. The county is excellent for day trips in whatever direction one may choose, making Gilmer County the destination of choice for folks just looking to get away from it all, or for those seeking a vacation home as a retreat, full time relocation, or a long anticipated retirement. Just living the good life. “A land of many waters, and priceless memories as well.” Gilmer County, Georgia; discover it for yourself. This is just a sample of all Gilmer County and the sister towns known as "The Ellijays" have to offer. We recommend that you and your family, friends and colleagues visit to learn and explore more of what Gilmer County is all about. Incorporated 1834 and designated as the Gilmer County Seat is the historical town of Ellijay. In 1854 a new courthouse was built on the town square replacing an older log cabin structure. In 1875 both the first newspaper in the county was published and a new stagecoach line stop were established in Ellijay. A little known fact to most, is that Ellijay is considered the oldest continually inhabited town in Georgia’s present boundaries, (Ellijay was originally founded on an ancient Cherokee village and trade site.) Even though Savannah Georgia was incorporated in 1733, there are historic writings mentioning the Ellijay area as a settlement as early as 1731. Before the Gilmer County region was known for its agricultural base, gold prospectors and logging companies harvested the local natural resources. By 1884 the much-needed railroad arrived in Ellijay transforming the town and expanding its development. A newly constructed depot, several hotels and stores were constructed at the beginning of the 20th century, creating a boomtown effect that has lasted right into the 21st century. The second courthouse located on the modest town square was torn down and re-established across from the square at the historic Hyatt Hotel. The old hotel (circa 1900) with its impressive white columns were re-molded in 1934 to fit the growing needs for the county courthouse and government center. A new courthouse constructed in 2003 is located next to the former courthouse. The architectural design of the new red brick courthouse blends beautifully with the old courthouse complementing the unique atmosphere of historic downtown Ellijay. 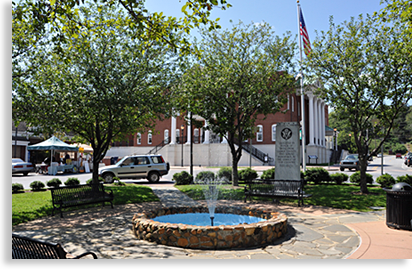 Today as well as in the past, Historic Downtown Ellijay is a quaint picturesque downtown shopping and restaurant center surrounding a beautiful town square with its old standing clock, shade trees, park benches and central fountain. The town square continues to play its part as the centerpiece in annual events and festivals. The downtown shopping district of Ellijay and the Lions' Club Fairgrounds host several annual events and festivals such as the “Georgia Apples Festival,” “Apples and Art,” “Taste of Ellijay,” the “Whole-Town Yard Sale & Outdoor Market,” and the holiday season’s “Light Up Ellijay.” The newly created “First Friday’s,” held across from the town square, is a once a month evening event lasting from April to November featuring live music and refreshments. Adjacent to Ellijay’s town square, along north and south Main Street, River Street and Dalton Street, visitors will find an abundant array of shops, fine galleries, excellent dining and unique eateries. An ideal experience for visitors and shoppers who enjoy leisurely strolls encompassed in an atmosphere of unique historical architecture within a classic railroad town. Local lodging and B&B’s along with cabin rentals provide comfort and convenience for folks looking to get away for that very special and unique experience. The Gilmer Arts and Heritage Center located in downtown Ellijay at 207 Dalton Street, is a non-profit, local arts organization encouraging a range of artistic expression. The Gilmer Arts and Heritage Association’s central role is in preserving the area’s cultural heritage and in sustaining the best quality of life in the region by offering visual arts, performing arts, and more. The Gilmer Arts and Heritage Center offers a wide variety of exhibits and performances throughout the year, including “Bringing Ellijay Sensational Talent” series to the GAHA Community Theater. Over all it’s a celebration of the literary arts, including major art shows, festivals, workshops and classes including art, music and dance. The Gilmer County Historical Society and Civil War Museum is located at 138 Spring Street, a half block from the old courthouse. The museum makes its home in the historic Tabor House built in 1870. 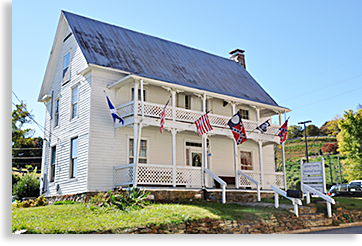 Today this historical landmark provides a modest museum and information center for the Gilmer County Historical Society and offers access to Gilmer County’s Civil War Library. Local historical books are available in the museum as well as Gilmer County Genealogy books and other items of interest. There is also a quaint little Gift Shop inside the Tabor House. Downtown Ellijay is ideal for history buffs that enjoy old architecture and leisurely strolls through a historical and classic mountain town, taking time to step out of the present and into the well appreciated past. The Historical Railroad Depot and several other historic structures adjacent to the depot including the old track line are located on River Street just south of the Historic Downtown Ellijay District. The depot has been well maintained yet not open to the public at this time. Just the same it’s great opportunity for a photo shoot. Located between the Ellijays, and shared by the towns, visitors, and the greater Gilmer County area, is the Coosawattee River Park. The river park is located at the junction of South Main Street and Highway 76/282. Located within the city limits, this county park is maintained by the county recreation department and is open to the public. The river park has a pool, tennis courts, baseball fields, two playgrounds, two covered pavilions, public restrooms a walking trail along the river. It can be a little difficult to tell where Ellijay and East Ellijay (the Ellijays) begins or ends, yet if you ask any local resident from either town they will quickly clear up the confusion, and proclaim their sole affections for their personal community. You could say these two towns, (or cities if you prefer,) are divided by the river. “Which river would that be” you might ask. Is it the Ellijay River, the Cartecay River or maybe the Coosawattee River? For the most part it’s all three, and the mystery of the location lies within its name, “The Ellijays” for those that are a little slow off the mark such as myself. This geographical area was naturally ideal for settlement, due to the convergence of two rivers becoming a third. Early settlements at the river convergence dates back to an ancient Cherokee village and trade site that was witnessed in documents by white explores in 1731. The first white settler arrived in 1769, braving the frontier well beyond the Colonial settlements east of the Blue Ridge. In 1539, European explorer Hernando De Soto and his expedition, found their way into the area just southeast of the Ellijays along the Coosawattee River below the Carters Lake’s Dam. The expedition spent a month at the village of the Coosa people, ancestors of the Native American Creek people. Ironically, and by the United States government’s choice, the area of East Ellijay saw a lot of activity with the building of Fort Hetzel in 1838. Fort Hetzel, (no longer in structural existence) was one of the many regional removal forts for the government forced Cherokee exodus to the western frontier. A most horrific event in history when all southeastern Native American were forced from their beloved homelands to reservation lands beyond the Mississippi River. U.S. forces under General Winfield Scott, acting under the orders of President Andrew Jackson’s Indian Removal Act, found the area east of East Ellijay an appropriate location to build a restraining area (fort), to house the Cherokee people before sending them mostly on foot over a trek, hundreds of miles long, a nightmare journey known as the “Trail of Tears.” It is estimated that roughly 2,000 Cherokee died in route from exposure, fatigue and disease. For more information concerning this event and other historical facts, visitors can visit the Gilmer County Historical Society and Civil War Museum located in the in Ellijay at historic Tabor House (1871) in Ellijay. This was an unfortunate time in history for the East Ellijay area. Though off to a rough start, East Ellijay soon began to share in the glory with Ellijay when the railroad came to town in the latter 1800’s. Even though the railroad depot was in the town of Ellijay, it had to pass through East Ellijay to get there. Ellijay with all its historical turn of the 20th century architectural structures; seemed to be the one that got all the glory. Yet East Ellijay in its own right progressed and prospered right alongside its sister city. East Ellijay’s development is more evident today than ever before. What East Ellijay had over Ellijay is its wide-open spaces, ideal for future development. Ellijay got the railroad in the late 1800’s and East Ellijay got the four-lane corridor along Hwy 76/515 in the late 1900’s. Along this modern day corridor lays lodging, restaurants, and a large open shopping mall area loaded with stores, services, popular franchise businesses, large apple houses and lots of room to grow. Today, one might consider the charming Historic Downtown Ellijay as the “Old City”, while East Ellijay has emerged as the “New City” of the Ellijays, even though they both had their start at the same historical time. Each day with each new construction being added to the landscape, East Ellijay is becoming a more modern metropolis in comparison, yet just as warm, charming and friendly as its sister city Ellijay. It’s a tale of two cities sharing one love for its homeland Gilmer County, with its rivers, meadow-lands, foothills and beloved Blue Ridge Mountains. Spread throughout Gilmer County’s mountain lands, foothills, and meadows are its historic crossroad communities with names like, Boardtown, White Path, Cherry Log, New Hope, Tails Creek and Cartecay. Historically, family farms and logging communities forged their livelihoods out of this rough and untamed wilderness. Farmers cleared the land, mills were built to grind the grain, gold was prospected and forests we leveled to feed the hunger of a growing nation. Fortunately in the 1920’s the National Forest Service was established, restoring the mountain slopes with trees in order to stop the erosion that was laying waste to the land. Their hard work recreated the beauty these mountains were destined to possess. The old gold and mineral prospecting sites finally panned out, and the streams and waterways became alive once again. Yet it is in these type of small, old-fashion farm communities that you can find throughout Gilmer County that have held it all together to this day, even down to the very simplicity of their society. Though these quaint communities seem beyond the reach of today’ modern world, it is for a good reason. It’s the residents and visitors to these areas that want it that way. It’s a throw back to the past for some, peace and tranquility for others. 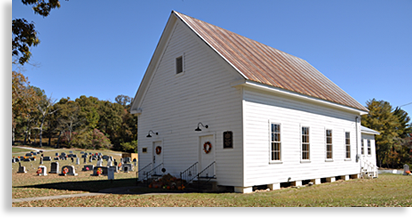 Historic symbols like old barns, farmhouses, primitive homesteads and well preserved historic churches dot the countryside of Gilmer County. One example that stands out against this rural background is the little white Cartecay Methodist Church originally erected in 1834. The present historic building was erected in 1859 and remains in style and arrangement as originally built. The new larger Cartecay Methodist Church is located behind the older church. During the War Between the States (Civil War), the building was guarded at night by groups of men to protect it from Union sympathizers who roamed the countryside looking to cause havoc. The first Sunday School held at the church was organized on April 20, 1851 and has operated continuously since that day. A normal feature of the historical church as well as with many other little old churches throughout Gilmer County and beyond, are the two doors you see on the front of the church. The two-door feature is part of the original design, in those days' men and women went into the church through separate doorways, and then sat on their respective side of the church. Men sat on one side; the ladies sat on the other side. Not only was church and state separated in our young democracy, it seems that the sexes were also separated under the roof of the one God. Looking back at the history of these rural communities is a way of not only seeing just how far we have come socially and economically; it’s also a way of seeing just how far we’ve slipped as a society, since many have chosen to shun the natural simplicity of life. Sometimes less is more. P.S.I prefer to sit next to Mrs. Highlander in church. That excellent description of Agri-Tourism is Gilmer County’s valley lands and agricultural base in a proverbial nutshell. Right down to kids petting young livestock, or accessing a corn maze created just for kids. For the big kids that we call “fun loving adults,” they can pick their own apples or load a big or small basket full of apples right into their vehicle. Wine lovers can dance on vineyard grapes during the vineyard’s harvest time festival, or take home a readily available exquisite bottle of private labeled wine, or even a case. What’s made the Agri-Tourism growers so special in Gilmer County are the family owned farms. Agricultural businesses that have been producing quality produce for generation, with many family farms dating back generations. There are several “farmers markets” scattered around the county offering delicious fresh produce of various types throughout the year offering local produce. When you consider 600,000+ bushels of apples alone are harvested annually in Gilmer County, it’s no surprise that the county has become the official state of Georgia’s “Apple Capital”, hosting an enormously popular and world-renowned “Georgia Apple Festival.” During the second and third weekends in October, the festival is held at the Lions' Club Fairgrounds in the sister cities simply known as “The Ellijays.” This mega festival features arts and crafts, an apple pie and cake recipe contest, an old-fashioned cakewalk, clogging, gospel, bluegrass and country music and so much more. On the second Saturday of the Apple Festival, there’s a hometown parade that draws inspired and enthusiastic spectators to the town square in the Historical Downtown Ellijay District. Apple Alley lies in the southern area of the county along state Highway 52. Many of these orchards date back to the 1920’s and are still operated by the original families. 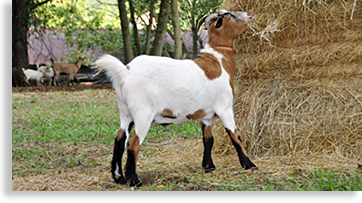 Along the northern edge of the orchard there’s a petting zoo full of adorable and friendly goats, both big and small that just love to be hand fed, a great treat for kids and adults of all ages. A quiet country stroll through the apple orchard takes visitors down rows of trees surrounded by a backdrop of rolling-meadows, foothills and broad mountain ranges, an excellent photo opportunity for you camera bugs. Hillcrest Apple House and Orchard is a destination in itself with beautiful lines of apple trees set within the picturesque valley of southern Gilmer County. The apple house is a large structure filled with various types of apples, gourds, baked and fried pies, gifts, local crafts and so much more. There’s also and automated farmer character on a tractor and a stuffed bear, (I’m assuming that the stuffed bear died of old age or natural causes.) There’s also a petting and hand feeding zoo with a small herd of pygmy goats, plus a goat tower where talented larger goats personally pull up a bucket on a rope filled with feed to feed themselves. A young calf, miniature bunnies and a mascot pig, are also available for feeding, plus an incubator with eggs and baby chicks. There’s a large wooden farm-styled stadium structure with stadium seating open during the weekends of September and October for those that just love little pig races both swimming and running. Little pig races are a sporting favorite of the Blue Ridge Highlander. (No gaming or betting is allowed on these little athletes, and no little pigs are harmed during any of these competitive races, little pigs just naturally love to run and squeal.) There are other kid friendly features at Hillcrest Apple House such as a large and small hillside slide for kids, a ground level seated zip-line and a small corn maze for kids. For both adults and kids alike there’s a small museum depicting rural mountain valley lifestyle and customs on display, along with several pieces of well-maintained antique farm equipment. Hillcrest is a family outing must visit, on your next fall trip to the mountains. Spread out across the county there are roadside stands and farmers markets offering a variety of specialties. These produce stands offer fresh, in-season local vegetables and fruits plus delicious jellies, jams and preserves, pickles, peppers and relishes. The numerous apple houses and orchards along with Gilmer County’s prized vineyards are all set against an outstanding backdrop of towering mountains and is a sight to behold, an experience you just wouldn’t want to miss. The Cherokee call this mountain and valley region “the land of many waters”, and with three rivers, a large recreation lake and a small high mountain lake, it surely lives up to its name. With mountains so high and valley’s that reach below the water’s of nearby Carters Lake, there is a diversity unlike any other region of the southern Blue Ridge Mountains. There are national forestlands and two enormous mountain wildernesses for those looking for adventure. Plus hugging the northwestern and southeastern borders of the county, are two popular state parks offering an escape into a land of natural wonders and ancient mysteries. Amongst the county’s 100+ miles of trails, there are rugged mountain trails as well as valley forest and lake side trails, plus there is a wide bike path along both sides of “Apple Alley’s” State Highway 52. 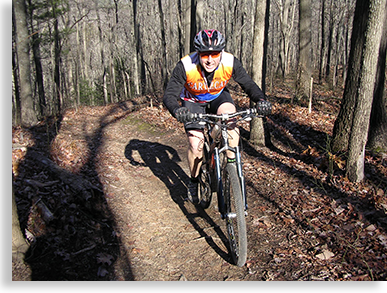 The county’s year-round bike trail systems are maintained by a group of volunteers from the Ellijay Mountain Bike Association. It’s hard to tell where Gilmer County’s scenic drives begin or end. Roadways throughout the county follow along a backdrop of scenic beauty. The recently dedicated Georgia Scenic Byway follows north along Highways 76/515 from Gilmer County’s southern border, through the Ellijays in the center of the county to the far northeastern county line. This scenic byway continues beyond Gilmer County and eastward through the North Georgia Mountains. The entire trip through Gilmer County is a comfortable ride along a four-lane highway with a convenient stop over in the historic towns of “The Ellijays”, where a side trip southeastward travels along Highway 52’s Apple Alley district and Vineyard, then on to the natural wonders of Amicalola Falls State Park at the county’s southeastern edge. Just off of the Georgia Scenic Byway and to the northwest of The Ellijays along Highway 52, a must see side trip will take drivers and passengers to the very northwestern edge of the county. Visitors to this region can enjoy the beauty of the counties mountainous country at the Cohutta Overlook, before pressing on a few miles to the mystery and wonders of Fort Mountain State Park. Another official scenic byway in Gilmer County is the Southern Highroads Trail. This scenic byway creates a loop beginning in the Ellijays, crossing the central mountains of North Georgia before cutting a path through the Up Country corner of South Carolina, then turning west across South-Western North Carolina. From the farthest western edge of North Carolina the byway enters Eastern Tennessee heading west thru the Ocoee River Gorge then turning south and re-entering Georgia and back into Gilmer County ending back into The Ellijays and completing the entire loop. For those looking to sample Gilmer County’ section of the Southern Highroads Trail from the Ellijays to the northeastern boundary of the county, they can travel along the four-lane Highway of 76/515. This northeastern route follows along what’s known as the Murphy Syncline, a natural fault line the traverses these mountains from Gilmer County to the base of the Smoky Mountains. This is a natural easy to drive terrain that cuts thru the mountains, never passing over any tall mountains. Along this section of the Southern Highroads Trail in Gilmer County, the route pass between the Rich Mountain Wilderness lands to the south, and the landmass of the Cohutta Mountain Wilderness to the north. Another section of the Southern Highroads Trail can be accessed in the town of Ellijay heading northwestern along Highway 52. This path along the outer edge of Gilmer County brings you to the beautiful and mysterious Fort Mountain State Park. In retrospect, it does seem like all scenic roadways lead from the historic towns of The Ellijays. Just a few miles southwest of the Ellijay’s and waiting to be enjoyed and explored is Carters Lake. The Coosawattee River and numerous other creeks and streams feed the lake’s glistening blue waters. The U.S. Army Corp of Engineers completed construction on the dam and lake bed in 1977. Two lakes comprise Carters Lake with the upper lake encompassing 3,200-acres with 60-miles of shoreline, the lower Re-regulation Lake below Carters Dam is within a 1,000-acre boundary. These bodies of water accent the beautiful surroundings of the majestic mountains of the Blue Ridge to the northeast with ridges and valley terrain to the south and west. Carters Dam at 445-feet is the highest earth filled dam east of the Mississippi River. The upper Carters Lake is completely surrounded by dense woodlands, offering great water-sport recreation for boating, skiing, jet skiing, canoe, kayaking, and swimming. Fishing, say no more. Anglers can go after a variety of game-fish such as, striped, largemouth, small-mouth, spotted base, walleye, bream, crappie, catfish and others. There are four well laid out boat ramp launches conveniently located around the lake’s shoreline plus a marina. Some of the largest fresh water houseboats I’ve ever encountered, I’ve seen cruising the waters of Carters Lake, what a way to enjoy and experience a setting like this against an incredible wilderness backdrop. With all the lake’s water fun, lets not forget the shoreline and woodlands themselves. There’s excellent opportunities for hiking, mountain biking, and camping which include restrooms, showers and playgrounds, plus there’s a fun sand beach for swimming and floating located at the Harris Branch Recreation Area, remember always use the buddy system and never swim alone. 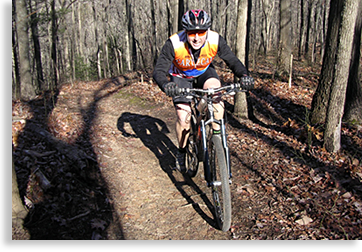 The Carters Lake Ridgeway Mountain Bike Trail is a challenging 5.6-mile mountain biking trail that winds through the Ridgeway Recreation Area. This popular trail can be shorten or lengthened by various trails, including a short loop at the beginning of the main trail’s start for those casual riders just looking of some fresh air and a light workout. Halfway around the trail and accessible by a roadway that travels through the center of the loop are two campgrounds, restrooms and drinking water. 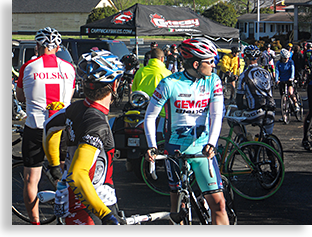 The Army Corps of Engineer’s maintains the bike trail, providing a great course for competitive races that are held in the spring and fall, with downhill races held at Carters Lake Dam. The wooded shoreline around Lake Carter is also popular with ornithology enthusiast (that’s bird watchers for us laymen.) Ornithologist can pick up a Birding Guide at the welcome center listing the numerous species that inhabit the area, and the best season for watching. Four well-maintained campgrounds along the lake’s shoreline are open in early April thru late October. The campgrounds have time controlled access gatehouses locked at 10:00 p.m. thru 9:00 a.m. Campers may exit the park at any time by using the electronic gate. Quiet hours are in effect from 10:00 p.m. until 6:00 a.m. Campground facilities include restrooms; showers, laundry facilities, trash dumpsters, dumping station, and boat launch ramps. Recreation and other amenities can include (depending on which specific campground), an amphitheater, playground and basketball goal, electric and water hookups. All pets must be on a leash no longer than 6 feet, penned, or caged. Behavior challenged pets are not allowed. Each campground facilities may differ. To know more and what facilities are present at each campground, campers may inquire and reserve campsites by calling the campground at 706-276-4413. The Carters Lake Visitor’s Center is a newly renovated welcome center offering educational interpretive displays of local wildlife, flora and history. Informative maps and brochures are available plus a friendly staff, that can help provide visitors with information for all of Carters Lake recreational amenities and wildlife management areas. The Carters Lake area has been estimate to have been inhabited by Native Americans for 11,000-years with archaeological discoveries dating back 5,000-years. A historical plaque located along the outer edge of the parking area at the welcome center tells the tale of a visit by the Hernando De Soto Expedition in 1539 to a local area village below the dam. Along with a party of 600, the Spanish explorers spent a month at the village. These Native Americans were the Coosa people, ancestors of the Creek people. European diseases left behind caused the survivors of the tribe to move further west leaving the area open to the Cherokee people that arrived in the area in the late 1700’s. The overlook of Carters Dam below the historic plaque offers a broad view of the upper lake, the earth dam, powerhouse and lower Re-Regulation Reservoir and lower earth dam and parking area as well as the Great Valley beyond. The park like setting overlook along the north side of the Welcome Center, offers exceptional views of Carters Lake’s larger body of water surround by woodlands and a beautiful mountain backdrop stretched out along the horizon. The Chattahoochee National Forest covers 749,549.71-acres of the mountainous high country of northern Georgia, and is managed by six ranger district offices. High mountains, deep valleys and river gorges, rushing waterways, magnificent waterfalls, hardwood forest, wildlife, camping, fishing, and miles upon miles of hiking, and mountain biking trails. 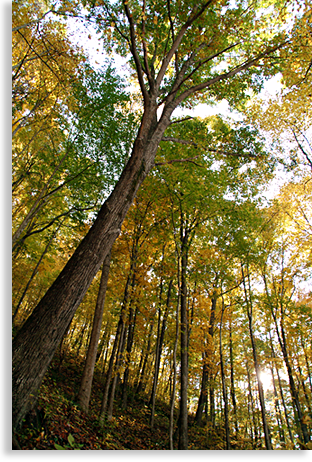 Included within the forest is a large section of the renowned Appalachian Trail. The southern most access point to the trail is located atop Springer Mountain in North Georgia above Amicalola Falls State Park. Counties within these mountainous regions of North Georgia average roughly a 50/50 ratio of public lands to privately owned properties. It’s this abundant ratio that offers so much wealth when it comes to enjoying the great outdoors for those visiting or living in the far southwestern Blue Ridge Mountains. Inexperienced hikers as well as experienced hikers should never hike alone. It’s highly recommended to bring along a companion, drinking water and some energy bars or other manageable snacks for day hikers. As a courtesy always pack out what you bring in and leave the least amount of footprint (human impression) as possible allowing others to enjoy the same unique experience as you have enjoyed. For more information concerning the wealth of this great forested mountain country, visitors can obtain maps and other materials concerning local hiking trails, biking trails, fishing areas, canoe and boat launches and camping areas from the local district ranger offices; contact information is available below. Open Monday-Friday 8:00 a.m. to 12:00 p.m.
Closed 1:00 a.m. to 4:30 p.m.
Two of the three rivers in Gilmer County, the Cartecay River and Ellijay River merge in the town of Ellijay to form the Coosawattee River. These rivers are popular with canoe adventures as well as seasoned and leisure anglers. A note to fishing persons is that most of these river’s lengths are through private owned property and not open to fishing except in some areas where experienced fishing guides are allowed to take individuals or small groups. Where these rivers pass through public owned areas, fishing is open to licensed fishing persons. The national forest and Carters Lake are open to the public. One favorite water sport in the county is canoeing, especially along the Cartecay and Coosawattee Rivers. Designated canoe launches are available to the public free of charge. A posted canoe launch sign and short gravel road just off Highway 52 leads to the Cartecay River’s edge and a parking area where canoeing enthusiast can access the gentle flowing and mostly small cascading waters of the Cartecay River. The Cartecay River follows a natural progression from flat-water to Class III rapids, ideal for novice to intermediate paddlers. From the parking area at this canoe launch there is a newly built flight of wooden stairs providing river access as well as a newly constructed primitive restroom called "the privy" (fancy words for a well appreciated outhouse.) Keep in mind, the Cartecay River flows through private held properties, the nearest take out or put in is just down the river at River Park in the town of Ellijay where the Cartecay and Ellijay Rivers merge into what then becomes the Coosawattee River. Canoeing can be continued or launched from the park down the Coosawattee River. A few miles from the park launch you will reach the public lands of Carter's Lake recreation and wildlife area. For thrill seeking white water adventurers there’s the Ocoee River Gorge just over the Gilmer County and Georgia/Tennessee state line. US 64 in Tennessee follows along this legendary river, and home of the 1996 Slalom Canoe/Kayaking Summer Olympics. White water rafting is by commercial rafting companies only. Kayaking and slalom canoes are open to the public and available for those brave enough to take on the rapids of the wild Ocoee, rated Class III to Class IV+ (or unofficially Class V.) There are also mountain biking trails near the Whitewater Center. Located on State Highway 52 on the very southeastern border of Gilmer County is Amicalola Falls State Park. 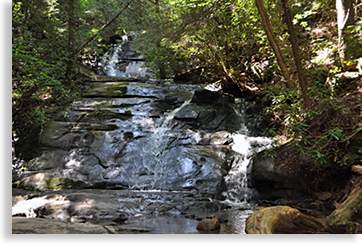 Seven cascades create the 729-foot waterfall that spills over Amicalola Mountain and into the 1,440-acre parklands below. Amicalola Falls are the highest waterfall in the state of Georgia. The falls are so breathtaking and bold that it can often be seen from the main highway below, especially in the fall and winter months. Amicalola Falls State Park lays along the Little Amicalola Creek, a trail from the parking area leads up to the upper falls observation deck, from the wooden deck stairs you can climb and switchback up to the upper falls overlook. For those not interested in a more than moderately strenuous hike to the top of the falls, you can choose to drive up a paved road to the upper falls overlook. Near the upper falls overlook, hikers can access the southern most end of the Appalachian Trail by hiking the 8.1 miles of the Appalachian Approach Trail. The approach trail leads to the top of Springer Mountain where the actual Appalachian Trial officially begins. Amicalola Falls State Park consist of several hiking trails, access to trout fishing, a campground with 17 tent and trailer sites, 14 cottages, 3 playgrounds, 5 picnic shelters and a challenging ropes course available for group team-building activities, all this in a beautiful mountain forest setting. Located along Highways 76/52 next to the upper northwestern boundaries of Gilmer County, is Fort Mountain State Park. This unique park setting is situated along a mountain top ridge with high mountains to the east and a long deep, wide valley to the west. This beautiful setting is one of the state's finest gems, you'll find hiking and biking trails, cascading waterfalls and streams, a mountain top recreation lake, an old goldmine and a pleasantly well maintained campground. The park takes its name from a Native American archaeological site where a low 855-foot long prehistoric stonewall rests. The purpose of the wall is uncertain, yet many theories exist. Early explorers and settlers believed the wall was constructed for Native American defense, some scholars believe it’s a ceremonial center constructed by the Woodland Indians around 500 A.D. Though the wall is long and precise in shape and construction, the wall is rather low yet wide, not very defensive. There are other interesting boulders and rock formations at the site that lie along the length of the wall as well as a large boulder carved into the shaped of a crescent moon. In the 1930’s the Civilian Conservation Corp built a 38-foot tall, stone observation tower some 520-feet north of the stonewall. Embedded into the tower is a heart shaped rock, the construction crew placed it there, reminiscent to a site legend that describes several circular concaved stone structures along the wall were used for fertility rites. Facilities located at the park include 15 two-three bedroom cottages, 70 tent and trailer sites, a swimming beach, bath house, paddle boats, miniature golf and 7 picnic shelters with tables. Five hiking trails and a recently established mountain biking trail are located along the park’s mountain ridge top. Located at the northern edge of Gilmer County along Highway 52 traveling northwest of the town of Ellijay, and about a mile or so south of Fort Mountain State Park is a stunning observation point overlooking the Cohutta Mountain Wilderness and Wildlife Area. The overlook sets upon a mountain ridge top and is made up of stacked, mostly flat-stones forming a circular wall with a flat stone floor. This observation deck is a one of a kind destination creating a scene and the sense of a crude ancient Greek forum. The site offers a special place for one to contemplate the wonders of the mountain majesty that’s beheld before one’s eyes, looking out and down upon a world not created by human hands. A very short trail leads from the parking area to the overlook; it's a worthwhile walk (not long enough to be considered a hike), leading to a grand inspiring view. This site is a must see when visiting Gilmer County. The Cohutta Wilderness and Wildlife Management Area, bordering the northwest region of Gilmer County, is the third largest wilderness area in the eastern United States. The majority the wilderness area lays in Georgia’s Chattahoochee National Forest, and the lesser amount of the wilderness, also known as the Big Frog Wilderness, lays to the north over the state line in the Eastern Tennessee’s Cherokee National Forest. It’s a land of hiking, backpacking, mountain biking, camping, fishing, kayaking, white water rafting, hidden waterfalls and the wonder of natural scenic beauty. The Cohutta Wilderness Area’s 36,977-acres are encompassed by the greater Cohutta Wildlife Management Area’s 95,265-acres. This enormous land mass contains a wealth of history and is even richer in natural and man-formed wonders such as Lake Conasauga. At 3,150-feet above sea level, it is the highest lake in Georgia. The lake is located on Grassy Mountain whose summit peaks at 3,682-feet. The highest mountain in the Cohutta Wilderness peaks at 4,224-feet. The main camping area at the lake has 35 campsites with tent pads, restrooms and centrally located cold running water. There is an overflow camping area with portable toilets and no water plus a group camping area in a large grassy field without tables, grills or water. The day use area has a restroom, water, tables, grills, two covered shelters and a parking area. The lake has no beach and swimming is restricted to the marked swimming area. The lake offers a boat ramp and parking area. The lake is restricted to rowing, paddling, canoe or rafts and electric motors only. Being a wilderness management area there’s an abundance of wildlife from black bears to deer, wild boars, bobcats and all kinds of little critters. Along with numerous creeks and streams two of the wilderness-rivers find their headwaters in the Cohutta Mountains, the Conasauga River and the Jacks River. These two wilderness rivers in a remote setting are ideal for anglers and fly-fishing persons. There are no paved roads in this wilderness area though there are several unpaved forestry roads that lead into and through these rugged mountains. The Forest Service maintains these unpaved roadways and they are great for scenic drives, if pavement isn’t a part of your idea of a scenic drive. A couple of sections can get a little bumpy, its best to use a higher road clearance vehicle, an SUV or pickup truck are perfect. The world-famous and renowned Ocoee River Gorge cuts through the northern section of the Cohutta Wilderness’s Big Frog Wilderness in Tennessee’s Cherokee National Forest. This section of the Ocoee River is all about commercial white water rafting and non-commercial kayaking and slalom canoeing. The paved Ocoee River Gorge Scenic Byway (US 64), travels along the river's northern riverbank where visitors can access the Ocoee Whitewater Center. The Ocoee River Gorge Scenic Byway is a beautiful scenic drive, and highly recommended. There are 95-miles of hiking and backpacking trails that criss-crossing the Cohutta Wilderness including the renowned Benton MacKaye Trail (trail blazes are off-white). Benton MacKaye is known as the “Father of the Appalachian Trail.” MacKaye had long to have the Appalachian Trail traverse though the Cohutta and Rich Mountains, these mountains lie to the west of the Appalachian Trail. In October 1989, and in honor of Benton MacKaye the first 90-mile of a proposed 250-mile of the Benton MacKaye Trail was opened. The trail is intended to connect with a section of the Appalachian Trail creating a loop thru the southwest region of the Blue Ridge Mountains. This first section of the Benton MacKaye Trail; travels roughly from south to north thru the Cohuttas to US 64 and the Ocoee River Gorge in Tennessee. In the southern regions of the Cohutta Wilderness, hikers can access this trail along Boardtown Road; this trail into the Cohutta’s is on the north side of the rural road, parking is limited. The Highlander’s Gilmer County mobile GPS App can help guide you there, it marks the southbound access to the Benton MacKaye Trail (trail blazes are off-white). The southbound Benton MacKaye Trail leads to the Rich Mountain Wilderness. The popularity of mountain biking is growing evermore popular in the Cohuttas. 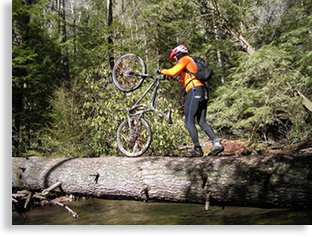 Gilmer County is Georgia’s official “Mountain Biking Capital.” Bear Creek Camping, Hiking and Biking Trail is just northwest of the town of Ellijay. State Highway 52 north leads to Gates Chapel Road, turn right and continue past Gates Chapel until you reach the signage for Bear Creek. Turn right onto forestry road and continue to the parking area. Bear Creek Trail is a 6.7-mile double loop trail very popular with hikers and mountain bikers and lies along the outer western edge of the Cohutta Wilderness. For nature lovers the trail leads 0.8-miles to a giant Gennett Poplar tree, the largest in the county. Since most of the trees were once logged in the area, this is quite a special specimen to behold. For mountain bikers, the Bear Creek Trail will test the strength and will power of bikers who can’t get enough ups and downs and bumps and grinds. The first 1.6-miles of the trail is typical wilderness cut trail that turns into old forestry and logging roads before returning to a more natural wilderness cut trail for the remainder half mile or so. This access point to the Cohutta’s is way out of town so bring along plenty of water and power bars. A word of wise to novice bikers, “always drink when your not thirsty, and eat when your not hungry,” dehydration and exhaustion can overtake bikers before they know it. Plus a reminder to all visitors of wilderness areas, when entering these remote regions of forestland what you bring in you must take out; act courteously. The Bear Creek Trail and Camping area has only dispersed style camping and vault type restrooms available, and there’s no running drinking water. The Rich Mountain Wilderness in the northeastern region of Gilmer County lies in the Chattahoochee National Forest. This mountainous wilderness area, consist of 13,276-acres and has numerous mountain peaks ranging from 2,000-feet to 4,081-feet above sea level. A land of natural wonder and beauty offering access to camping, fishing, hiking, mountain biking, rushing creeks and cascading waterfalls, plus the largest gold nugget ever found in the state of Georgia was discovered in the Rich Mountains. The Cartecay River also finds its headwaters in the remote upper reaches of this mountain wilderness. Though mountain bikers enjoy many of its trails, one of the most popular trails in Rich Mountain Wilderness and Gilmer County area is off State Highway 52. Here mountain bike lovers will find the Red & White and River Loop Mountain Bike Trails. The Red and White trail is 2.6-mile long and is rated from beginner to intermediate; this loop trail can occasionally encounter sections that are rocky or root rough with a long hill climb toward the end. The River Loop Trail also connecting to the Red & White Trail, is 3.4-miles long and is rated intermediate to advanced. This trail offers a lot of challenges, riders should exercise precaution, you will encounter several rocky descents that should be walked even by an advanced rider to avoid injuries. The trail follows the upper Cartecay River so watch out for a tire swallowing sand trap and the occasional downed tree cluttering the trail, plus there’s a challenging steep downhill run near the end of the trail. There are many waterfalls in the region of the Rich Mountains. One of the most accessible waterfalls is Fall Branch Falls that lies along the eastern border of Gilmer County in the Rich Mountains. The falls are located a short distance from the parking area, about 15-minutes along a moderate upward grade of the Benton MacKaye Trail. The trail follows to the left of Fall Branch Creek, as visitors get closer to the falls they can normally hear the falls rushing water during average rainfall. When visitor can pretty much catch a distant glimpse of the falls they’ll come across a sign marker on the right of the trail that will lead down a short trail to the falls, its gathering pool and an observation deck. Continuing up the Benton MacKaye Trail a short distance brings visitors to the top of the falls where a small picnic and/or campsite area are about thirty yards above the top of the falls along the upper creek. The easiest and most paved roadway that will take visitors to the trail-head to Fall Branch Falls; is to take Aska Road south from the neighboring town of Blue Ridge. Follow Aska Road south then turn right on Stanley Creek Road. Follow Stanley Creek Road to where the pavement ends at the historic house and small farm of the late Forest Service Fire Warden Garfield Stanley. Continue past the farmhouse a short distance to the far end of the farms open field and cross the old forestry road bridge over Fall Branch Creek. There’s a parking area to the left, the trail is on the right. 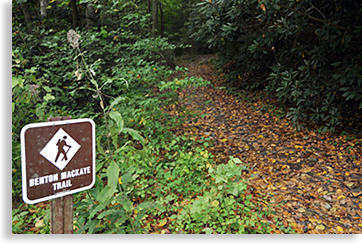 This trail-head to the falls is also a great access point along the Benton MacKaye Trail that leads northward through the Rich Mountains of Gilmer County. If our readers would like to experience the natural beauty of Fall Branch Falls, they can download the Highlander’s Gilmer County mobile App and view a video of the falls, a special treat for our Blue Ridge Highlander readers. The App has a GPS route to the falls, but our friends at Google Satellite prefers to take you the long way along an unpaved roadway then through miles hiking along the Benton MacKaye Trail from north to south. Apparently no one from Google Satellite has tried this route personally, yet I understand that sometimes throwing darts from a satellite in space and into the wilderness can be compared to throwing horseshoes at a steel stake, close just doesn’t make it. Even though Mrs. Highlander and I have driven directly to all our GPS mobile sites to mark them precisely, Google satellite and mapping just wants to fight us on this location. Take my advice and use the written direction guide above. During the summer of 2012, the Appalachian Trail celebrated its 75th anniversary. 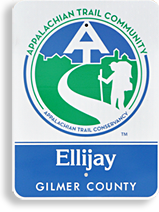 On September 14, 2012 in honor of the anniversary, Gilmer County was given the official designation as the newest Appalachian Trail Community. The southern most access point on the Appalachian Trial is located near the southeastern edge of Gilmer County on Springer Mountain 8.1-miles from Amicalola State Park. You can say that the Appalachian Trail either begins or ends in the Blue Ridge Mountains of North Georgia depending on where one begins their journey. Stretching over 2,100-miles from Georgia’s Springer Mountain to Mount Katahdin in Maine, the Appalachian Trail is world-renowned to serious hikers and backpackers as well as day hikers looking for fresh air, exercise and outstanding mountain views. The trail’s grand vision began in 1921 by forester, regional planner and conservationist Benton MacKaye, and completed in the Georgia region in 1931. Just outside Gilmer County is a special treat for you rod and reel loving anglers. It’s the Chattahoochee National Fish Hatchery, located at the end of Doublehead Gap Road, 5-miles off GA 60. This hatchery produces approximately 850,000 rainbow trout annually. Spawning operation are not a part of the hatchery, fertilized eggs are shipped here for incubation and development before being released into the streams, rivers and lakes of the Chattahoochee National Forestry. The hatchery is a fascinating site for kids and adult anglers alike. 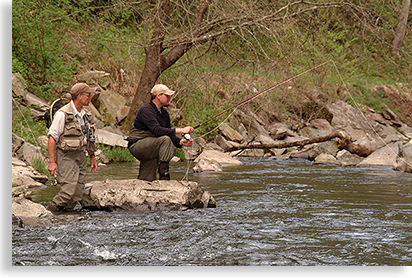 Visitors can fish with a license along Rock Creek and Rock Creek Lake near the hatchery. Nearby Frank Gross Campground has 11 campsites for tents and trailers up to 22-feet, drinking water, picnic tables and sanitary facilities are available. Escape the stress of your daily life and enjoy the year-round peaceful surroundings of all of our upscale, privately owned North Georgia mountain cabins. All of our cabins are furnished with tasteful, cabin decor and have all the amenities needed to make your stay a comfortable one. Our cabins feature gas log or wood-burning fireplaces, hot tubs, gas grills, Cable/Satellite TV and high-speed Internet. "Mention you found us on the Highlander and get a 10% discount on your first stay"
Apple Pickin' Jubilee September - October, U-pic apples and petting zoo everyday. On Saturday & Sunday Only...Hillcrest Orchards has Ellijay's only swimming pig races, cow milking, wagon rides, pony rides, pedal cart rides, giant jumping pillow, giant slides and playgrounds. Visit the Apple Museum, Moonshine Museum, and watch live entertainment on the stage. September & October 9:00 am - 6:00 pm • November 9:00 am - 5:00 pm. You are invited you to join us any day in September through October to one of our 2 U-Pick Orchards for apple picking, apple cannons, hayrides, and the petting farm. Before you leave, try our famous fried apple pies, people come hundreds of miles just for our pies. Great mountain adventures is offering the "Best Fishing" available in the Mountains. We create a fishing trip, designed specifically towards your needs with a professional fishing guide to guide you to make the most of your fishing adventure on the Finest Lakes, Rivers and Streams in the Southern Appalachians! So much water to choose from and an adventure you'll never forget. The Ocoee River is often described as the roller coaster of the southeast. Come experience what has been called the greatest white water center in the world. Professional river outfitter with over 30 years experience. Our safety record is unsurpassed in the industry. We believe our staff is simply the best in the business. Guides are chosen for their character and enthusiasm for sharing the outdoors with you. Experience this unforgettable whitewater adventure through the gorge. The Nantahala is exciting, and a great time, but not as wild as the Ocoee. This is a river that you can bring children on as young as seven years old. Experience the excitement of Patton's Run, the fun and splash of Tumble Dry, the rush and roar of riding Class III Nantahala Falls. For a bigger thrill, try taking one of our Duckies down the river! Whichever course you choose you are sure to enjoy the newest outdoor adventure to hit the US. All our courses offer a soaring and gliding experience naturally fueled by a gradual drop in elevation. All trips offer fully guided tours with 2 or more Rangers on at least 10 zips, 4 bridges beginning with a training course at each location. Catch the surge and ride the rapids on the exciting Ocoee River in Tennessee or North Carolina's Nantahala River for an experience you won't forget. Challenge your skills on the high ropes just for the thrill. Sit tall in the saddle for a leisure ride through the beautiful scenery of the Blue Ridge Mountains. Camp out or stay in log cabins while letting the kids sleep in groups in one of several bunkhouse's. We will help you create a custom retreat for you or your group. Blue Ridge Community Theater invites you to "Come Out and Play." There is nothing like the energy you feel when attending a live performance and we are here to help you experience that feeling. Blue Ridge Community Theater's mission is to enrich the cultural life of residents and visitors through performances, productions and education of all aspects of contemporary and classic theater. 2013 we will be hosting 7 Main Stage Shows with 12 Performances for each show, 8 evenings of music along with 13 Sunny D Performance, our Children's Theater Program.